Fienile 1: 1 kitchen - living room, 1 bedroom, 1 bathroom. Fienile 2: 1 kitchen - living room, 1 bedroom, 1 bathroom. Capanna 1: 1 kitchen with terrasse, 1 living room, 1bedroom with bath, 2 small bedrooms with 1bathroom. Capanna 2: on the first floor, 1 kitchen - living room, 1 bedroom, 1 bathroom. 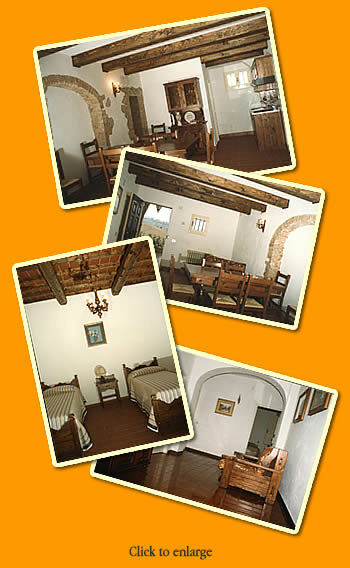 Cacciatori: 1 kitchen - living room, 2 bedrooms, 1 bathroom. La Cantina: 1 kitchen - living room, 2 bedrooms, 1 bathroom. Casa Velia: on the first floor with entrance - living room, 1 kitchen, 3 bedrooms, 2 bathrooms and a terrasse with a great view. All apartments have a separate entrance and private space outside.